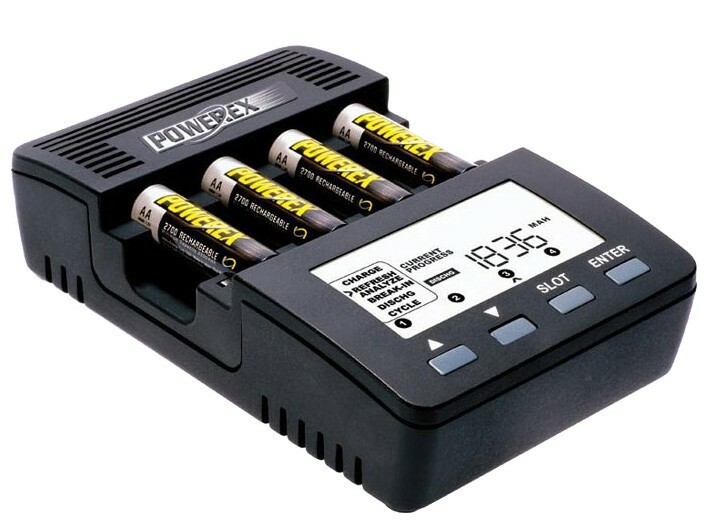 The Maha Powerex C9000 battery charger features five unique programs which can be used to charge, refresh and analyse rechargeable batteries. The C9000 features a large backlit LCD display so all settings and parameters are clearly visible. Four independent charging slots allow the user to charge, refresh or analyse single batteries separately. A user could for example charge one battery in one hour and slowly discharge two other batteries at the same time. Independent slots are also on the basis of the very accurate -ΔV charging process. Programs two and three can be used to detect internally damaged or ill conditioned batteries. Those batteries will not be noticed with a regular charger, but will greatly reduce the runtime of a set of multiple batteries. Often ill conditioned batteries can be refreshed using programs two, three or five. The charging current can be programmed by the user between 0.2 and 2.0 Ampere. At 2.0 Ampere batteries will be charged within approximately one hour. Batteries won't be overcharged because of the -ΔV process and the independent channels. Maximum battery life. First recharges the battery, rest for one hour, discharge, rest, then recharges again. Charging and discharging rates are programmable. Reports the discharge capacity at the end of the cycle. Useful when the battery capacity needs to be determined. Also useful for batteries with degraded performance. Will determine the batteries capacity very accurately following the official IEC standard. Recommended to form brand-new batteries. This process activates the battery. Discharges the battery at the selected rate. Performs a charge-discharge cycle for the programmable number of times. Charging and discharging rates are also selectable. At the end of the cycle, a final recharge is applied. The charger is powered by a compact world travel adapter (Euro plug, 100 - 240V). An adapter to use the charger in your vehicle is also available.